College hosts its first kayak event at Espada Park. 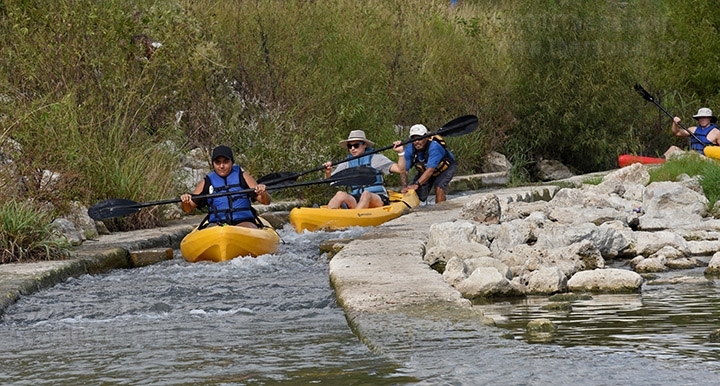 The office of student life hosted a Saturday kayaking excursion on the South Side that started at Espada Park. Two-miles downstream, the San Antonio River gave students insight into the area’s history. Twenty-five students signed up and 15 students participated in the event. The tour started at VFW Boulevard bridge and finished at the south entrance to Espada Park, 1750 SE Military Drive. The tour lasted two hours and included two water chutes and a scenic route. Jim Lawson, tour and kayak guide for Mission Adventure Tours, informed the students Sept. 19 that the San Antonio River won an international award, the 2017 Thiess International River Prize in Brisbane, Australia. “I looked for kayaking in the area since we don’t have vehicles to take a bunch of students, and it was here right in our backyard,” Martinez said. The cost of the kayak event was $660. For more information on Mission Adventure Tours, log in to www.missionadventuretours.com.